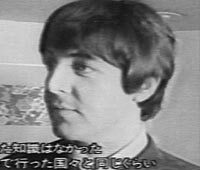 ABOUT THIS INTERVIEW: This very brief interview with the Beatles took place at the Hilton hotel as the group was ushered from their rooms to the press conference. The interview was filmed for Japanese television and was conducted by the man who would introduce them on stage for each of their Tokyo performances. 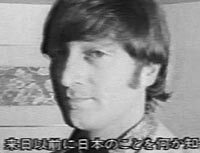 The Beatles would appear for a total of five concerts at the Budokan - one concert following the press conference on June 30th, and a matinee and evening performance on both July 1st and 2nd. Q: "My name is Eric. Good to meet you." Q: "Welcome to Japan. Well, I'll be the emcee for your show. And well, I have a few questions here. Did you have a good sleep?" Q: "Did you have any knowledge about Japan before coming here?" PAUL: "Yes a little bit, you know. Not much though." 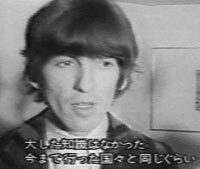 GEORGE: "About as much as we know about most places we go to." Q: "I see. Well, how are the Japanese fans?" PAUL: "Great. Seem very great, yeah. We get lots of letters from Japan." Q: "You didn't meet them at the airport?" JOHN: (jokingly) "We couldn't see a thing through the television lights." RINGO: "It's AMAZING security, you know. I've never seen so many people guarding us." Q: "We don't want you to be hurt or anything." Q: "So we're trying our best." RINGO: "But we don't want the security to hurt the fans, you know. Don't get too rough with them." Q: "Mmmm. I understand you've met your Queen." Q: "What was the impression?" RINGO: "Uhh, she's okay. Very good." PAUL: (jokingly) "Yes, yes, one of the best." Q: "How did you feel when you received the (MBE) medal?" GEORGE: "Tired. It was early in the morning, about ten o'clock." RINGO: "We don't like to get up too early, 'cuz we don't go to bed 'til late." Q: "What musician and composer do you respect most?" PAUL: "No I don't know, really. (pause) John Lennon!" JOHN: (comically, shyly) "...Paul McCartney." PAUL: (jokingly, exaggerated) "Ha, Ha, Ha!!" Q: "And uhh, Paul's marriage..."
PAUL: "Yes, it's not true. It's wrong. It's George's marriage." PAUL: (gesturing to the others) "These three are married." Q: "How many times do you wash your hair in a week?" 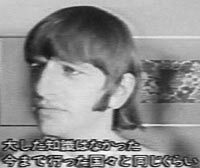 RINGO: "About once. It depends, you know." JOHN: "Depends how hot it is... how dirty it gets, you know." RINGO: "Depends what you're doing." Q: "Do you cut it often?" RINGO: "That's the same, you know. Whenever you feel like. You don't do it every week or you don't do it every month, you know. It just happens." JOHN: (sings as they depart) "Now we say goodbye!! Da-dah, da-da-dah!!"